What would you do if the bully in your class or office tells you that you cannot call your mother, " Emak- Malay for Mom" because he calls his mother "Emak" - That is precisely what a handful of Malay Muslims want do to - they call their God, Allah, and they don't want Christians and Sikhs to call him by the same name, as if there are different Gods. It is a sin (Shirk) in Islam to acknowledge that there is another God, or separate your God from others. There is only one causer or cause that gave birth to the universe and the life forms, and you should be able to call whatever name you want. You don't own God, indeed reverse is true. An estimation of one tenth of one percent of Muslims believe that the Muslim majority has given them the permission to do whatever they please in the name of Islam. Let's call them the Fitna group; the trouble makers. Sadly, it is a part of the makeup of every religious, political, societal, racial and ethnic group. No one will have the last laugh on it. Now the latest Fitna (Arabic: فِتْنَة‎ - trouble) is caused by a few from within the Islamic tradition in Malaysia. They want to ban Christians, and in the past Sikhs from using the Word "Allah" to refer to God. The Word Allah did not spring up with Islam, nor have Muslims created it. The word Allah has been around, just like the Creator God has been around forever. Quran, 112: 2-3, "God the Eternal, the Uncaused Cause of All Being, He begets not, and neither is He begotten." Prophet Muhammad (pbuh) made it clear that he did not bring a new religion to the world; Islam was continuation and completion of religions that came before. In the movie Passion of the Christ, Jesus refers to God as "Ilahi", Muslims were thrilled as though Jesus has approved the name "Allah" for God. Some even said look Jesus called Allah for God as we do. What we forget is Allah and its variants were in usage before the birth of Islam as a religious entity. Should Christians ban Muslims from using the word Allah because Jesus, and in turn Christians used it before Muslims did? The Malaysian and the Indonesian Christians, like the Arab Christians, Bahá'ís, Sikhs and Mizrahi Jews use the term Allah to refer to God. "Cognates of the name "Allāh" exist in other Semitic languages, including Hebrew and Aramaic. Biblical Hebrew mostly uses the plural form (but functional singular) Elohim. The corresponding Aramaic form is ʼĔlāhā in Biblical Aramaic and ʼAlâhâ in Syriac as used by the Assyrian Church, both meaning simply 'God'. In the Sikh scriptures, Guru Granth Sahib, the term Allah (Punjabi: ਅਲਹੁ) is used 37 times. The name was previously used by pagan Meccans as a reference to a creator deity." The average Muslims have been duped over and over again by the mullahs, dictators, and the monarchs; and they want to decide what is good for the Muslim majority without even consulting them. Prophet Muhammad (pbuh) emphasized it with a personal example, when he told Fatima (ra) that she ain't going to get a free pass to paradise just because she is his daughter, he said, she has to earn it through good deeds, and she is individually responsible for it. Prophet Muhammad did not assign the responsibility to read and understand the holy book Quran to anyone else -- you read it as you are responsible for your actions. Islam is a religion that encourages peaceful co-existence of humanity. God wants us to live in peace and harmony with his creation; life and matter. We cannot let anyone destroy the character of Islam and its inclusiveness. Quran, 1:2 All praise is due to God alone, the Sustainer of all the Universe -- Alhamdu Lillahi rabbi alAAalameena. The learned High Court Judge of Malaysia, Mohamed Apandi Ali renders the following judgment on Monday, October 14, 2013, "The usage of the word Allah is not an integral part of the faith in Christianity, and "the usage of the word will cause confusion in the community." Some 200 Muslim fans of the said individual greeted the decision with thundering chorus of "Allahu Akbar" (God is Great). They were happy that Christians, Sikhs and Baha'is were denied their basic right to call God -- Allah. In simplistic terms, someone tells you that you cannot call your mother Mom, because he calls his mother Mom. Is that acceptable? Should Christians, Sikhs and others rejoice this oppressive decision? The answer is an emphatic no. The responsibility for peace and harmony in a given society falls squarely on the majority. In this instance, as a part of the larger Ummah, we, the Muslims around the world have a responsibility to protect the rights of minorities in Malaysia or elsewhere. Prophet Muhammad (pbuh) said, when you see oppression, the least you can do is to speak up. Thank God, we are following his guidance. Muslims do not have a monopoly in oppression, the tiny fitna groups permeate in each majority of people, be it Christians, Hindus, Jews, Buddhists and others. We have to consciously change this mind-set of the few. The government of the people of Malaysia cannot be run over by the opinion of an individual or the tiny group of people. 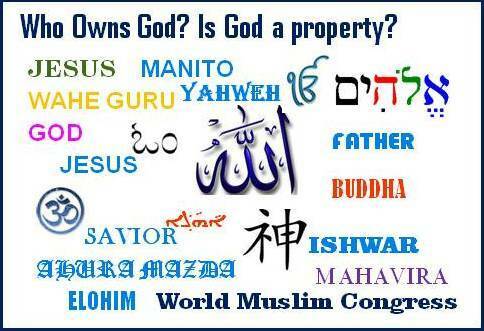 No one owns the word "Allah" nor does anyone own the many other names of God be it Yahweh, Ahura Mazda, Ishwar, Allah, or any other name to call the creator. The phrases like One God, One family or Vasudhaiva Kutumbukum, is all about creating cohesive societies where no human has to live in fear of the other. Quran could not be clearer than this, God says, "he has created us all from a single couple into many tribes, communities and nations." It was his choice for us to be diverse, and then he adds, "The best ones among you are the ones who learns about the other." Indeed, if we can learn to accept and respect the God given uniqueness of each one of the 7 billion of us, then conflicts fade and solutions emerge. The most important aspect of quoting the first and last chapters of Quran is to emphasize the wisdom and guidance from God to humanity in general. Both verses address the whole humanity and not just Muslims. Allah the God owns his creation and not vice-versa, indeed the Malaysian Judge and his buddies don't own Allah. Muslim author and illustrator Linda "iLham" Barto reminds that all the beautiful names belong to God. She says, "There are thousands of names and attributes for God because of the many languages, cultures, and religions. They all belong to the Creator of us all. If we are truly submitted to Him, we have submitted all that we have and all that we are to Him alone. We do not have the right to define and confine the Creator. He is abundantly generous to all, so let us not try to withhold His blessings from others -- including the blessing of being able to use any of His beautiful names." God belongs to all, we don't need to own him (her or it), let him remain the creator and causer and sustainer of our lives and let us accept him by the many names people call him. As a Muslim I welcome everyone to call God with his name in Arabic - "Allah" with equal devotion and honor. Quietly and peacefully this would be the response of an over whelming majority of Muslims in the world. It is time for us not to run over by the few Muslims who reduce God to Muslim God, what a crime! The old saying remains true, things are not going to change unless good people do something about it. Our first choice is to ask Judge Mohamed Apandi Ali to reconsider his decision, and we hope he values a society where no Malaysian has to live in apprehension, discomfort or fear of fellow Malaysian. Indeed, that is the purpose of Islam; to create peaceful societies.